Is it just me or is loooking up ways to prevent stroller theft at the happiest place on earth got you feeling a bit sad? It is not my favorite topic, nor one I’m writing with a great deal of excitment. But it has to be done, especially considering how easy and affordable these products are. Being apart of many Disney Travel Facebook Groups I think I hear about Stroller Thefts more than the average. It’s totally a thing and extremely preventable should you go in prepared. 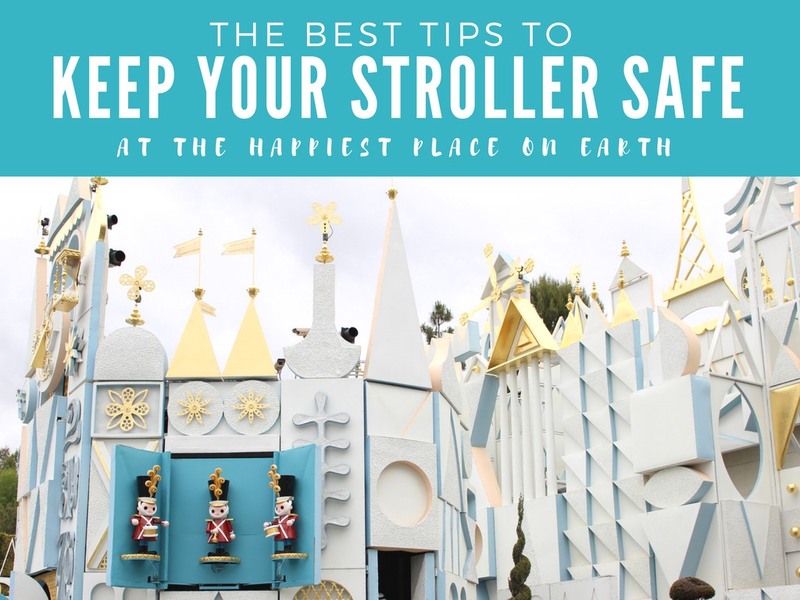 I have put together a few tips in how to prevent stroller theft in Disneyland, Disney World and HECK! for that matter everyday life. They’re not difficult to do, they will not break the bank, and they are quite helpful for your upcoming trip to the Happiest Place on Earth. A Stroller Wheel Lock is not new. It’s been around for ages and can come in extremely handy, wherever you go. However, there is a trick on how you can actually use it in any Disney Park. Some use their wheel locks to connect their Stroller to a stationary item, for example a fence at the park. In all Disney Parks this is a big no-no! You cannot for any reason lock your Stroller to Disney property, what you can do however is lock your 2 wheels together preventing someone from easily walking off with it. In a sea of strollers, if someone is looking to steal one, I’m certain they will go for an easy target. The stroller with a Wheel Lock will not be one of them. A bluetooth tracking device can not only help you track down your keys that you’ve lost for the 12th time this week. Or the phone that you could’ve sworn you just put in your purse. It can now also keep track of that stroller of yours. Connect a TILE to your Stroller and know where it is always. A recommendation I saw on one of my amazing Disney Traveling Facebook Groups, I praised her for her geniusness and ran and got some for our family. Not only will a Tile be hanging somewhere on our stroller, but also on our keys, in our luggage and of course on my cellphone. I’m determined to never lose a thing again! Not all tiles are the same, let me explain. While the tile Style is perfect for your keys and purse, the tile Sport is great for the stroller, your luggage and anything that may be treated… ruggedly. And finally the tile Slim would be for keeping track of all small things. Like your passports, your planner and how about inside that cellphone case? From permenantly marking your name on your Stroller, to a DIY Stroller Name Plate and even obnoxiously decorating your stroller to the point where nobody would want to steal it. These Stroller Hacks are just that, a smart but fun way to deter someone from chosing your stroller as theirs. Didn’t they learn anything from Dora? Nobody likes a theif, right Swiper? The first recommendation is putting your name permenantly somewhere on that stroller that’s EASY TO SEE. Want to take it next level? Have your stroller canopy embroiydered with your family name. The idea came from another serious Disney fan, Melanie. She had her’s done in California at Janene’s Embroiydery. Locals can pay her a visit and those from afar are welcome to inquire with her on pricing. Second Stroller Hack is a DIY Stroller Name Plate. We found this one on Pinterest, Laura over at Pink Cake Plate created a free printables for us to use. Take it to your printers, have it laminiated and zap-strap that baby to the stroller handles. I get that it’s something that can be cut off with a bit of effort, but that’s the whole point. If too much effort is involved in stealing your stroller, this will hopefully be enough to not have it a target. And finally, decorate your stroller like it’s your childs FIRST BIRTHDAY. Leave no decoration behind and make the very most of every inch of space. Balloons, battery operated twinkly lights (also great for trying to spot your stroller at night) and bright colored bandana’s. Not only a great way to pick your ride out in a magical sea of strollers, but a good deterant for those who don’t want to stick out like a sore thumb when trying to make off with a stroller that isn’t theirs. Other incredible (and hilarious) suggestions for preventing Stroller Theft at Disneyland were hanging a “fake” dirty diaper from your stroller handle bars. Ain’t nobody gonna’ steal that! Another great tip was to take a picture of your stroller when entering the park. Should anything happen to it and you need to report it missing with a Disney Cast Member you will have a photo of exactly what it looked like and it’s visable contents (you can thank Tamara, another Disney-Finatic over at Discovering Parenthood for that one). I read another great suggestion which was to leave your expensive stroller at home and don’t take the chance at all. Buy an umbrella stroller for the sole purpose of park visits (most are under $20) or else rent one from the Disney park. And finally, a Disney Tip I did not know. Anything you buy in the park itself can be sent to the front gates at no charge giving you no need to lugg around all day long. This makes the chances of your beloved souvineers getting lost or stolen completely impossible. Ask a Disney Cast Member upon making your purchase to have it held for you at the front gates. Another option is to have it delivered to your Hotel if you’re staying at a Disney Resort. Find more detailed information here on the Disney website. Hopefully you all found this information helpful and it will help with easing your mind during your next Family Vacation. Preventing Stroller Theft at Disneyland is something we can all do together. As is raising a family, it takes a village. Disclosure: I have partnered with Tile to share our experience. All opinions are my own. Also; we are a participant in the Amazon Associate Program. An affiliate advertising program designed a means for us to earn fees by linking to Amazon and affiliate sites. I love Tile! I use them for my bicycle, but what a great idea for travel gear. I never knew stroller theft was an issue! I didn’t even know this was a thing! I don’t know why I just thought why would anyone bother stealing a stroller? But it makes sense as these things aren’t cheap!! Great tips and I’ll definitely utilise them. Sad to think we have to worry about this, especially at a place like Disneyland.